Sen. Maria Cantwell is calling for federal regulation of Bakken Shale crude in the aftermath of Friday’s derailment at the edge of an Oregon town in the Columbia River Gorge. The political aftershocks from last week’s fiery Columbia River Gorge train derailment continued Wednesday as Sen. Maria Cantwell called for the federal Transportation Department to set standards for the volatility of crude shipped by rail. “I have heard just since last Friday from practically every major city or region of our state about their concerns about the continued movement of this product” from North Dakota, Cantwell, D-Wash., told Transportation Secretary Anthony Foxx during a Senate committee hearing. North Dakota has set limits on the vapor pressure of state crude to improve its safety during transport by reducing flammability. But Cantwell thinks the state standard is too weak and asked Fox to move forward with an “interim” federal rule. There were no injuries. But all together, some 32,000 gallons of oil burned off, vaporized or were released into the environment, according to information released Wednesday. 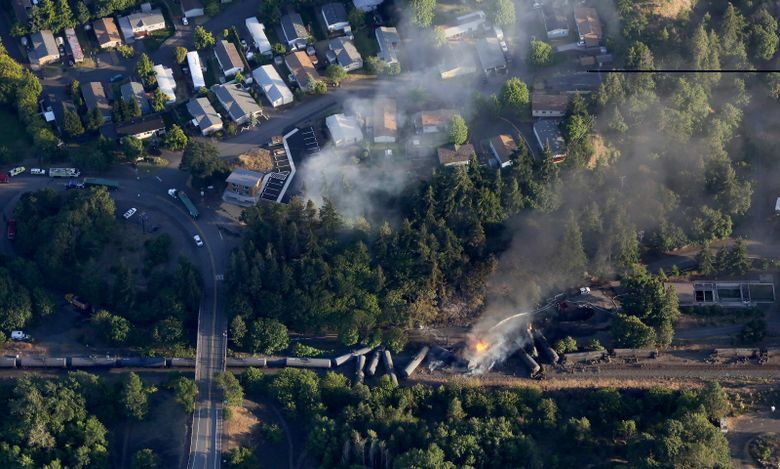 And the derailment stepped up the debate about the future of crude-by-rail in the Northwest. A Union Pacific spokeswoman said that a preliminary investigation indicates a problem with a fastener that connects ties to the rails contributed to the derailment. At the time, the train was traveling at 26 mph, well under the 30 mph maximum, according to spokeswoman Raquel Espinoza. There were no explosions, according to Espinoza. Yet even at the moderate speed, some of the cars carrying crude — known as tankers — were damaged and leaked. Four cars were involved in a fire. The volatility of the Bakken Shale crude produced from fracked wells, compared to more traditional crudes, has been a big point of concern. There have been several fiery rail accidents, including the 2013 Lac-Megantic disaster in Canada that killed more than 45 people. The North Dakota Industrial Commission approved an order that requires, as of April last year, all state oil producers to install oil-conditioning equipment to reduce vapor pressure to 13.7 pounds per square inch, under a measuring system developed by the American Society for Testing and Materials. The commission concluded that level would put the oil within a range considered to be stable. Cantwell, on Wednesday, appeared to take aim at the North Dakota standard. She asserted at the U.S. Senate Commerce, Science and Transportation hearing that oil can now be shipped by rail at vapor pressures higher than limits set by “people” who move crude through pipelines. Kari Cutting, a vice president of the North Dakota Petroleum Council, disputed Cantwell’s statement. She said that all crude that falls within the North Dakota state standard could be shipped by pipeline, as well as rail. “A pipeline can handle any material coming out of North Dakota,” Cutting said.